This month we honor the great men and women that have served this nation by protecting our freedoms at home as well as abroad. This is why the #GreenLightAVet program exists. It is a small way for the rest of us to show our troops that we support them and appreciate everything they have done and will do for our great nation. Our troops have sacrificed so much to protect us that we need to do something for them and changing at least one light in your home or business to a green light is that little thing. This can easily be achieved by using florescent tube covers to quickly change the florescent light color to create any ambiance you can think of. 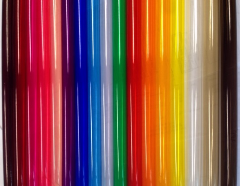 Our florescent tube covers come in a vast array of colors that you can choose from and we can ever create custom colors. That way you can change your colors to anything you want throughout the year for any occasion. It makes the process quick and easy without having to mess with a lot of things. And our tube sleeves help guard against the possible dangers of a light tube breaking and will contain the glass and phosphors. These florescent tube covers are made from a high strength polycarbonate that will help protect your lights from dirt, dust, bugs, and other possible things that could get inside of your light covers. This helps reduce any cleaning you may have to do as well as helps safeguard your lights from breakage. The florescent tube covers come with snug and secure end caps to keep the light exactly where it should be as well. So, why do we use green as the color to honor and support our veterans? The green light is symbolic as the color of hope, renewal, and well-being. Green light is also a phrase that generally means, “go”, or move forward. Every year over two-hundred-and-fifty-thousand troops transition back into civilian life. When they are out of uniform it isn’t as apparent to us that they had served and they are almost more in camouflage than when wearing their fatigues. These troops need our support because this transition can be daunting. Changing one light to a green light is a simple way of telling the troops that you care about them and you acknowledge the tremendous actions they have taken to keep us safe at home. Green-light a Vet is part of a movement to get people talking about veterans and raising awareness to their plights of joblessness, homelessness, and the mental anguish that they endure. The simple act of lighting that green light gives our vets hope and lets them know that we are here for them. For more from Diffuser Specialist, click here. For more on fluorescent tube guards or to place an order, click here. For more info on Greenlight a Vet, click here.